A combination of private training and group classes is the BEST way to ensure your dog is getting all the training she needs. Private Lessons help you focus on your specific training challenges while Group Classes guide you through all the basics and help your dog learn to work with you with distractions. You will probably learn some things you didn’t even know could be valuable to train and you can learn a lot by watching other dog & handler teams. Experience the Joy of Living with a Well-Mannered Dog! This program is for the family who wants to learn the basic skills to train a well-behaved family pet. Your dog will learn to relax, focus on you, walk on a loose leash, and begin to develop self-control. You will learn basic dog training formulas, management techniques, and problem solving principles. Private lesson can be used prior, during, or after Beginner Class session to solve any specific challenges you are encountering. 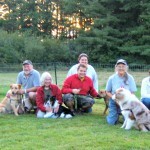 This program is for the family who wants to learn basic training skills, practice those skills with real life distractions, learn additional techniques to get rock solid stays & recalls, and explore other sports to enhance basic obedience skills while exercising & having fun with your dog – A great program for anyone who wants to have an active life with their dog. This is our most-flexible program to suit the needs of the busy family. Private lessons to learn the basics, a choice of your favorite group class to take your training to the next level, and Out & About Town practice to ensure your dog can be well-behaved anywhere. Call us TODAY to find out how easy and fun it can be to train your dog!